The Universal City Walk is having a “Citywalk Summer Block Party” with free entertainment nightly, all summer long, and have a stage set up right across from the Hard Rock Cafe. 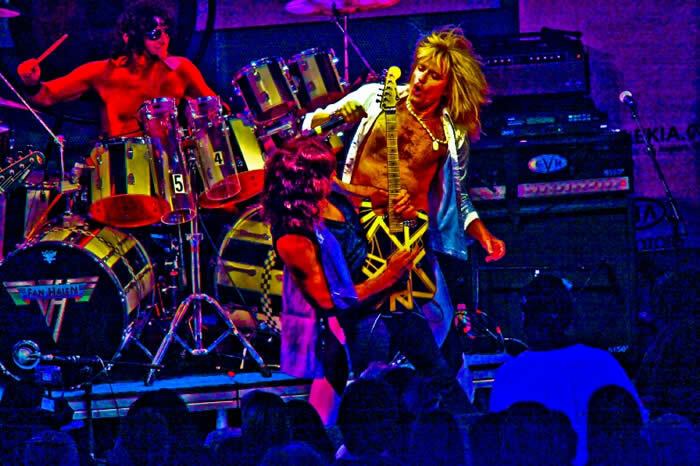 I checked out Fan Halen, tribute to Van Halen, at their early 8:00PM show on Friday, July 24th. The crowd was diverse, consisting of ALL ages, many in Van Halen/Fan Halen T-shirts, and quite a few people who had just wandered up. Brian Geller definitely looked the part of David Lee Roth…from his long blonde hair to his spandex, kicks and puckered lips. Derek Fuller took on Eddie Van Halen’s role, smiling the entire time as he knocked out killer riff after riff on his signature guitar and even had a couple jumps of his own. Bass player George DuBose was a lot of fun, and ended the set with a Jack Daniels bass like Michael Anthony is known for. Drummer Larry Cornwall played a shirtless Alex, hitting hard and heavy on his double-bass kit. Songs included “Unchained,” “Runnin’ with the Devil,” “Dance the Night Away,” “You Really Got Me,” and “Hot for Teacher.” Before playing “Panama,” “Roth” told us that he went to Universal Studios that day and ran into a “kid” in a Van Halen shirt who said that he could play better than the guitar player that they have. 15 year old C.C. entered the stage, or should I say stole the stage, to rock out for “Panama.” It took him a minute to warm up, but before you knew it he was all over the stage, fists in the air, getting the crowd to scream for more. Encore “Jump” was the perfect song to end their 45 minute set, which was packed full of hits. Fan Halen has a lot of fun with their show, including multiple costume changes, energetic stage presence and even a little comedy. The crowd seemed satisfied, and I know they will be coming back for more.